Difference between OTF (Open Type) or TTF (True Type) font formats? 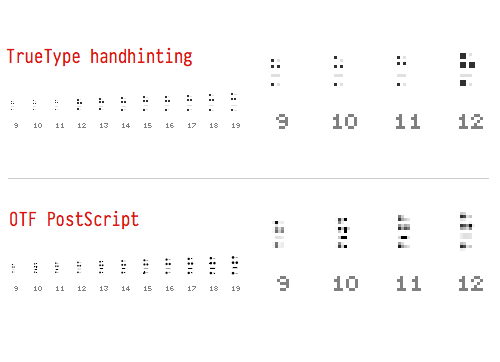 On a Mac, when I'm downloading fonts am often given the choice between OTF (OpenType Format) and TTF (TrueType Format). Is there any difference in the way ligatures work or anything between the two formats? OTF is more likely to be a “better” font, as it supports more advanced typesetting features (smallcaps, alternates, ligatures and so on actually inside the font rather than in fiddly separate expert set fonts). It can also contain either spline (TTF-style) or Bezier (PostScript Type 1-style) curves, so hopefully you're getting the shapes the font was originally designed in and not a potentially-poorer-quality conversion. On the other hand, if you're downloading free fonts from shovelware sites, you're unlikely to get any of that. Indeed, you may simple be getting a TTF font renamed to OTF. One note from personal experience however: depending on what you're going to be doing with these fonts, I've found it's much easier to get tools that work with TTF as opposed to OTF. If you're just using them for desktop publishing / word processing, either will work fine, but if you're going to be doing anything programmatic, I'd recommend TTF just due to the higher number of tools / libraries out there. This comes a little confusing as some .ttf font files may look as if they are in legacy ANSI-Windows TrueType format, whereas in fact they may be full featured OpenType fonts. Another minor difference in the specification seems to be that ttf flavoured OpenType fonts may address the same glyph with several code points. Therefore, this saves some space, if e.g. the upper case versions of b, β and в (read: latin, greek and cyrillic ‘B’) have the same shape. I don’t agree with those who say that OTF is the best format. TTF offers the designer the possibility to change the details of the rasterization on screen and in print (if the designer knows how to do it). I found this useful, and it answered my questions enough to stop digging deeper. MS: What's the difference between TrueType, PostScript, and OpenType fonts? TrueType fonts can be scaled to any size and are clear and readable in all sizes. They can be sent to any printer or other output device that is supported by Windows. OpenType fonts are related to TrueType fonts, but they incorporate a greater extension of the basic character set, including small capitalization, old-style numerals, and more detailed shapes, such as glyphs and ligatures. OpenType fonts can also be scaled to any size, are clear and readable in all sizes, and can be sent to any printer or other output device that is supported by Windows. PostScript fonts are smooth, detailed, and of high quality. They are often used for printing, especially professional-quality printing, such as books or magazines. Which font format will work best for me? It depends. If you want a font that prints well and is easy to read on the screen, then consider using a TrueType font. If you need a large character set for language coverage and fine typography, then you might want to use an OpenType font. If you need to print professional-quality print publications, such as glossy magazines or commercial printing, PostScript is a good choice. For more information, see Fonts: frequently asked questions. Not the answer you're looking for? Browse other questions tagged fonts truetype opentype or ask your own question. Windows 7: install True Type or Open Type font version? What happens if both OTF and TTF version of the same font are installed? Is it possible to convert an Open Face Font to TTF? How do I stop Mac PowerPoint 2011 from using ligatures in font? Are .otf fonts safe to install on Windows?